There are many ways to stay in Hood River during the rally. 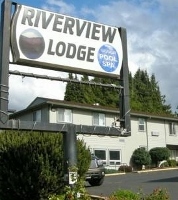 Below we outline details about on-site camping, RVing, hotels and motels and other accommodation options in the area. Many rally goers enjoy camping with us at the rally. Car camping is provided on the south side of the venue, while tent camping is provided on the middle interior area. Electricity is available for all tent and car campers. The well-maintained bath house features hot showers and restroom facilities. Tent/Car camping - Advance Rate: $45.00 per person in addition to the basic registration rate of $85 per person. Walk-up rate will be $55 in addition to the basic walk-up rate of $95 per person if you do not register in advance. Price is for the entire rally. Single night rates are not available. Camping Gear Rentals: Camping gear rentals are available through Sound RIDER! There's no need to own or carry your own gear. You can rent from us and enjoy the convenience of having your campsite setup when you arrive. We can accommodate 1-4 persons per tent site. Camping gear rentals sell out every year, so reserve your gear today. Rates begin at just $66 for one person for a 1-4 night gear rental (tent, sleeping bag, air mat; tent site rate above not included). Call 206-650-9102 for rates and to reserve your gear. RV spaces are situated just across from the tent camping area. You may use your own on-board shower or the restroom and shower facilities next to main building. Advance Rate: $80 per RV in addition to the basic registratoon rate of $85 per person. Walk-up RV rate will be $90 in addition to the basic walk-up rate of $95 per person if you do not register in advance. RV Rentals: Some rally goers enjoy renting an RV for the event. It's quite simple. 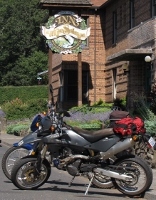 Ride two-up from the rally site to Portland and have the pillion drive the RV back to Hood River.ave the pillion drive the RV back to Hood River. Additional accommodations are available 30 miles east in The Dalles, OR; 27 miles west in Cascade Locks, OR; or 32 miles west in Stevenson, WA.